One of the first things you notice about New York City is that it’s incredibly diverse- bafflingly so - but no one ethnic group stands out. There are a lot of people and a lot of types of people, all packed in together within a few square miles. The diversity is a visual declaration that the city belongs to everyone. It almost seems like a practice run for an increasingly intermingled world. With a reputation as a place of great opportunity and tolerance, the city attracts people from all over the world and over the years the steady stream of immigrants has assembled a city where over 170 languages are spoken and nearly 40% of people are foreign born. The Greater New York area is home to the largest Jewish population outside of Israel, the largest Chinese population outside of Asia, the largest Puerto Rican population outside of Puerto Rico, and the largest Greek population outside of Greece. Queens, one of the five boroughs making up NYC, is the number one most diverse county in the United States. Nearly 140 languages are spoken in its 109 square miles alone. Throughout many parts of the city, it’s not uncommon to find blocks where handfuls of restaurants stand side by side, each offering a different type of cuisine from a different ethnic group. 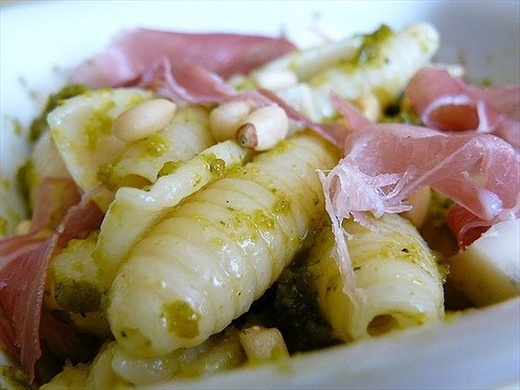 There are, of course, the fusion restaurants that have creatively redefined cuisines to create interesting combinations of flavors or to cater to western tastes. But for the most authentic dishes that preserve traditional cooking styles and nuances, visits to NYC’s ethnic enclaves are a must. 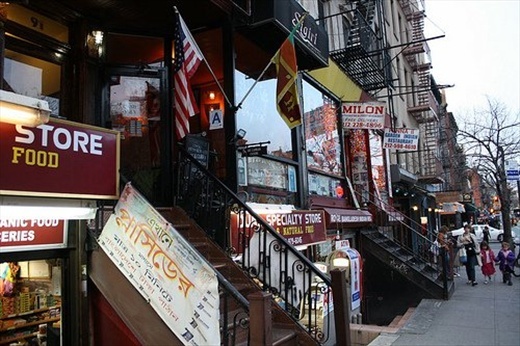 NYC is comprised of dozens of neighborhoods, but within those neighborhoods are even smaller enclaves, ethnic “little’s” like Little Sri Lanka, Little Germany, Little Poland, Little India, Little Manila, and Little Odessa where the food is magnified by the entirety of the cultural experience. Within the enclaves, the foods are arguably as good as those in the country that birthed them; the social norms and customs of the ethnic group can be observed and experienced via the retail stores, entertainment venues and services set up to cater to their specific tastes and lifestyle. It may only be a subway stop and several minutes away from Manhattan, but Little Greece in Astoria, Queens has held onto its old world traditions. Despite the steady influx of young professionals who have moved to Astoria for its [relatively] affordable rents, the neighborhood continues to be the home to large extended Greek families who maintain many of the customs of their home country. 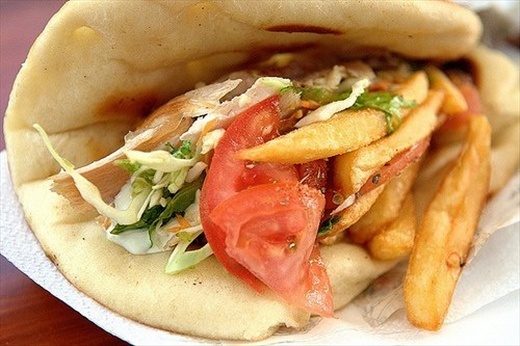 Corner 26 Taverna has incredible gyros and other traditional Greek foods in a homey setting. For a more upscale experience Christos Steakhouse, which seems randomly situated at the end of a residential street, offers dry aged steaks accompanied by Greek specialties. Informally named Little Tokyo, St. Marks Street in the East Village of Manhattan is home to tattoo parlors, kitsch, and all things stylishly gritty. 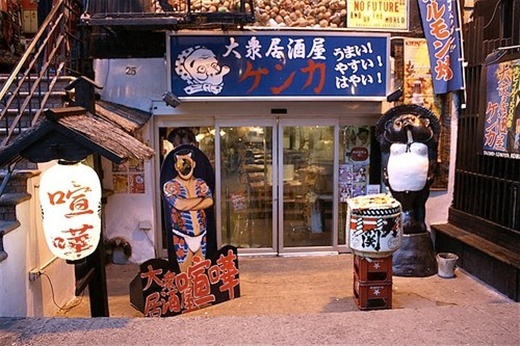 It’s also home to several Japanese grocery stores and an abundance of restaurants where you can try Japanese food and dining in several incarnations. Where to eat: For a leisurely experience, head to Kenka, an izakaya or essentially drinking establishment where you can order small plates with your sake. But the best part occurs after your meal: with your check, you receive a small cup of colored sugar granules that you can then spin into your own batch of cotton candy at the front of the restaurant on your way out. If you’d prefer something more substantial, Yakitori Totto has grilled, skewered meats galore. And if you’re looking for comfort, nothing beats a hearty bowl of ramen that puts those ten-cent, just-add-water packs I ate throughout college to shame. 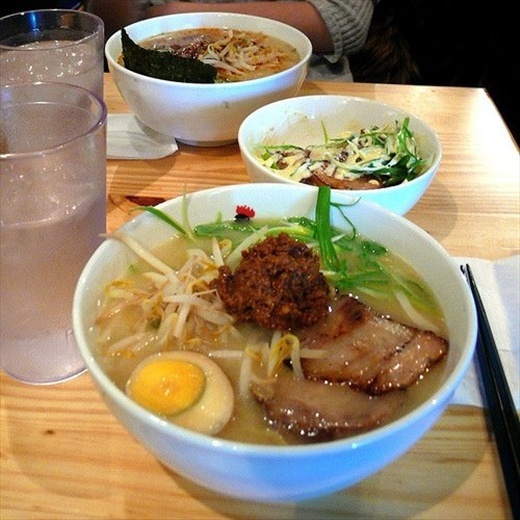 Menkui Tei, just around the corner from St. Marks, offers several versions. 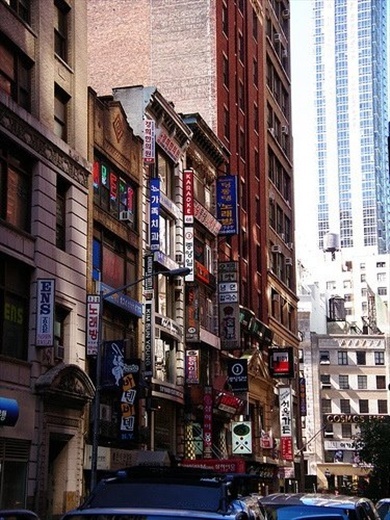 Chinatowns may exist the world over, but how many cities can say they have three? NYC’s major Chinese enclaves can be found in Brooklyn, Queens and Manhattan but many other smaller ones are interspersed throughout the city. But don't be fooled- not all Chinatowns are created equal. The Chinese characters on the buildings may appear the same, but the Chinatowns are each inhabited by different groups of Chinese immigrants who speak distinct dialects and have their own takes on traditional Chinese dishes (or different ones altogether!). The Chinatown in Manhattan is the largest and most popular among tourists, great for knockoff everything and good eatin’ on the cheap. Many a food and travel show have come through in recent years elevating some places to superstar status. But don't be deterred by the influx of tourists, the places are popular for a reason. 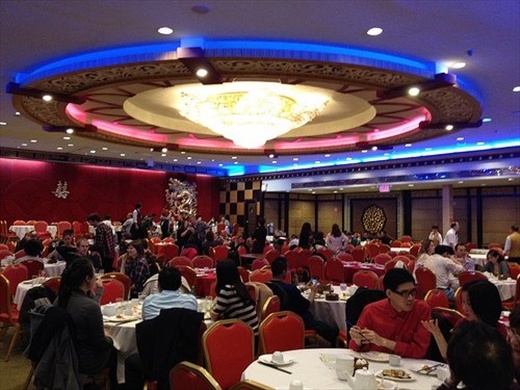 Where to eat: For a traditional pushcart dim sum brunch, head over to the multi-floor Golden Unicorn, a behemoth of a Chinese banquet hall. If you’re looking for a unique lunch or dinner experience, drop by the hole-in-the-wall and literally named Tasty Hand-Pulled Noodles for a comforting bowl of noodle soup. If you’re lucky, you can even watch the [tasty] noodles being made [by hand]. 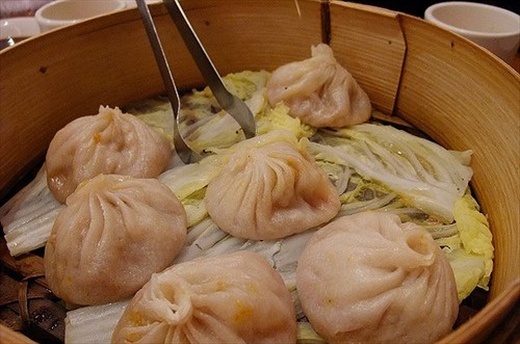 And if you’d prefer your soup a different way, like say inside of a dumpling, head over to the ever-so-popular Joe’s Shanghai. 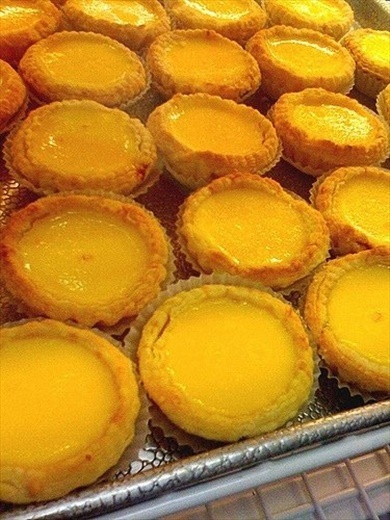 After dinner, finish off your meal with something sweet at Tai Pan Bakery where egg tarts, slices of cake and buns filled with a myriad of different flavors- like red bean or custard- can be had for under a dollar a pop. The unlikely neighbor of Chinatown, this enclave is trying to make the most of the little space that it still has as Chinatown continues to close in around it. The two enclaves are so tightly nestled together that the National Register of Historic Places actually lists them as a single entity. As one of the early immigrant groups to NYC, Italians are now spread out in other residential enclaves throughout New York City, but Little Italy still marks the area where many first settled. A bustling, densely packed area decked out in green, white and red, it’s also the home of the annual Feast of San Gennaro which lasts for 11 days, bringing out long rows of street-side food vendors and capped with parades. 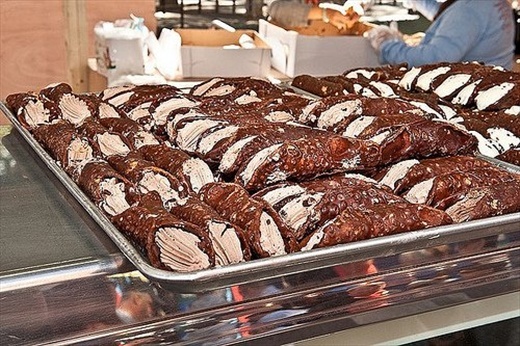 Where to eat: For incredible Italian pastries, from zeppolis to cannolis to tiramisu, head over to the always-packed La Bella Ferrara. 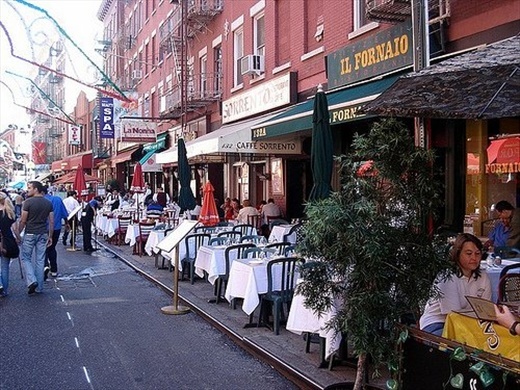 Little Italy’s main sell is its plethora of restaurants with outdoor seating. There are so many juxtaposed that it looks just like an endless row of chairs and tables, one restaurant blending into the next. One of the best is Paesanos on Mulberry Street, Little Italy’s main thoroughfare and thus, a great place for people watching. Or try Torrisi Italian Specialties, the new kid on the block (literally!) that’s already generating a lot of buzz, so much that the owners recently opened a spin-off sandwich shop called Parm, named after and heralded for its specialty, the chicken parm. Koreatown, or K-Town if you want to sound like you’re “in the know,” is several blocks long and conveniently located in midtown Manhattan but you might just miss it if you’re not looking. Situated right off of one of the largest shopping areas in Manhattan, it’s overshadowed by the large chain stores and traffic and doesn’t shout with the same bustle or lights as some other ethnic enclaves. But if you look closely, you’ll discover a wide assortment of establishments, all contained within a few buildings, from spas to karaoke bars to retail stores. And, of course, restaurants. 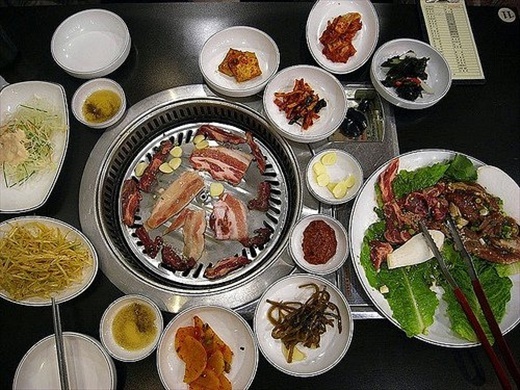 Where to eat: Restaurants serving Korean BBQ and other traditional dishes like bibimbap are in abundance. Kum Gang San is a long-standing favorite. 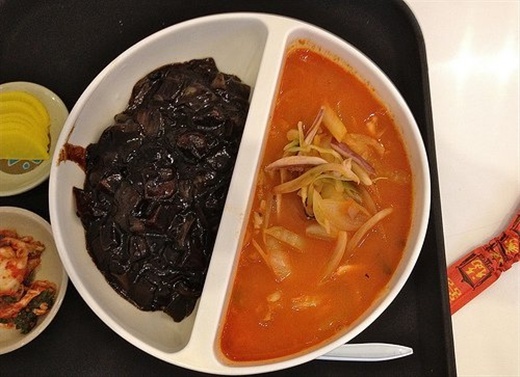 K-town is also where a couple of notable food trends proliferated in NYC. It is the home of NYC’s first Pinkberry frozen yogurt joint and the place where the Korean fried chicken craze first took off. 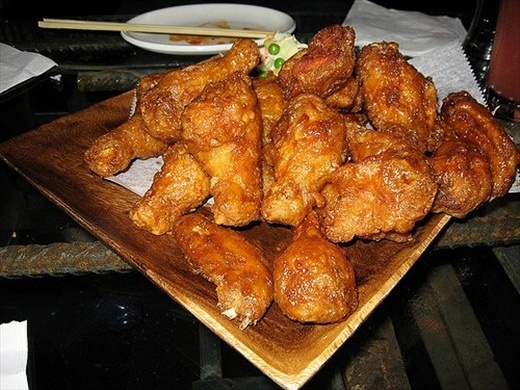 Bon Chon chicken is one with an enormous following. Many similar frozen yogurt and chicken business have opened and/or closed since. And if you can’t make up your mind about what you want to eat, Food Gallery 32 awaits, a food court where you can select from dozens of dishes at several stalls. And if you still can’t decide, order one of the split bowl meals where you don’t have to. Lanthy is a freelance travel writer and blogger based in New York City. She shares her adventures at home and abroad on her blog, nod 'n' simile. Her next great journey will be a trip around the world beginning in July. No matter where in the world she is, you can find her on @nodnsmileNYC and Facebook.